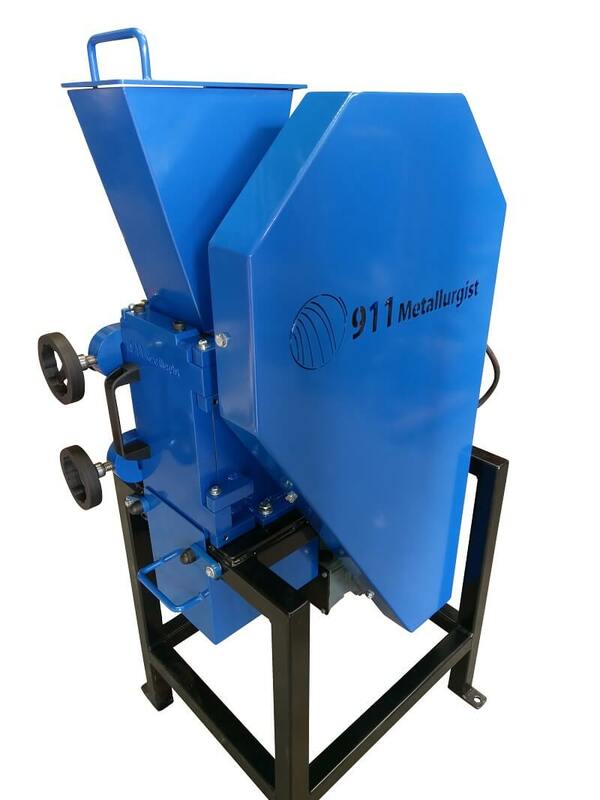 Our production size industrial roll crushers will crush up to 140 TPH depending on the model you select. Irrespective of the part which rolls may play in the future in their relation to the two extreme limits of size-reduction, there is no doubt that they have achieved for themselves a secure position in crushing products of intermediate sizes. This is partly due to their large capacity and low cost of operation. It is also due to the fact of their mechanical simplicity, which involves the principle of the toggle-lever in overcoming crushing-strains exerted by particles brought within the angle of nip of their surfaces. Since their revolving masses also serve to absorb their own “ peak-loads ” when properly fed, a moderate and fairly uniform application of driving-power is able to accomplish a considerable amount of effective work in splitting and shattering rock-fragments. 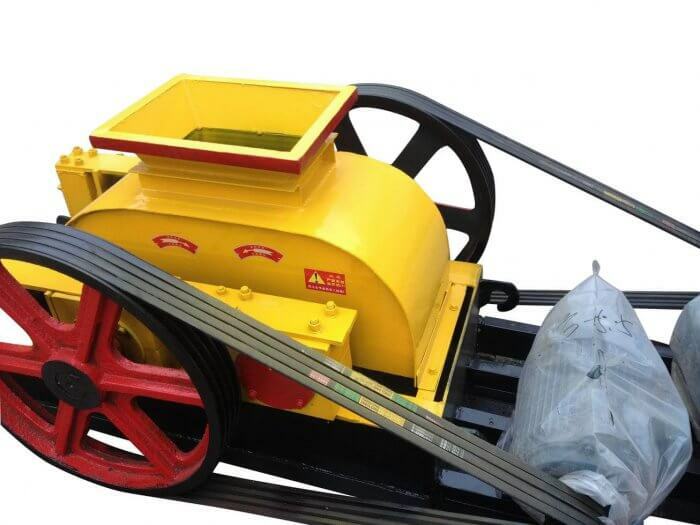 The art of crushing ores and other materials by means of rolls is a comparatively recent one. While the first record of rolls using iron crushing-surfaces dates back to the year 1806, when they were employed in Cornwall, their principal development has taken place during the past 30 years. To Stephen R. Krom belongs the credit of the pioneer in introducing the belted high-speed roll, which has had its origin and a marked development in this country. His notable contribution to the art was in the use of a single bed-plate or frame supporting the roll-shafts, and to which levers holding the movable roll-bearings were pivoted. He also made use of steel tension-rods to support the crushing-strains, and of hammered- steel tires for the crushing-surfaces. 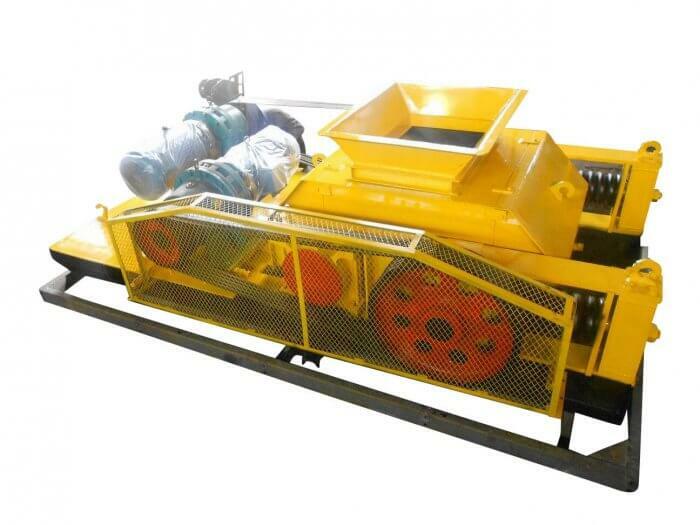 These changes brought the design of crushing-rolls to a high level. Following closely thereon, about 1885, W. R, Eckart conceived the idea of the swivel or ball-and-socket support for the roll-shaft bearings. 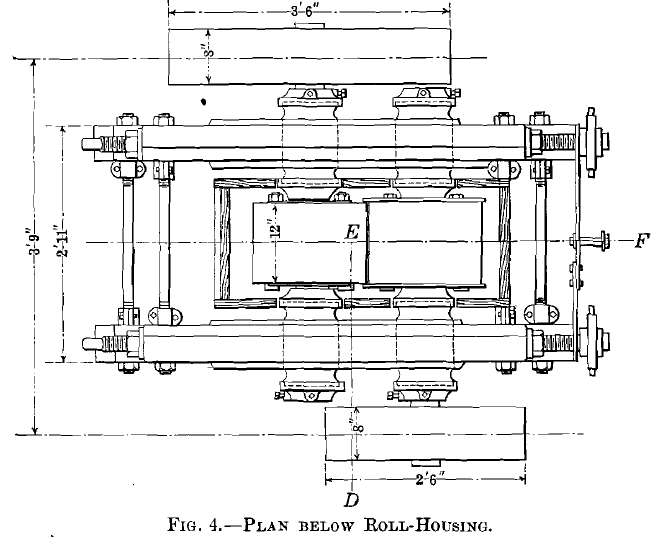 This is an excellent mechanical conception, especially for bearings held against a spring pressure, and while it may not be necessary for all types of rolls, yet it has been quite generally adopted by other roll-designers, and illustrates the refinement which roll-construction has now reached. Other engineers, as, for example, Argali, Vezin, Roger, and Sturtevant, to mention only a few among many, have also given the closest attention to the various details of rolls, such as the frame, springs, bearings, and shafts, and have developed many novel and original designs. 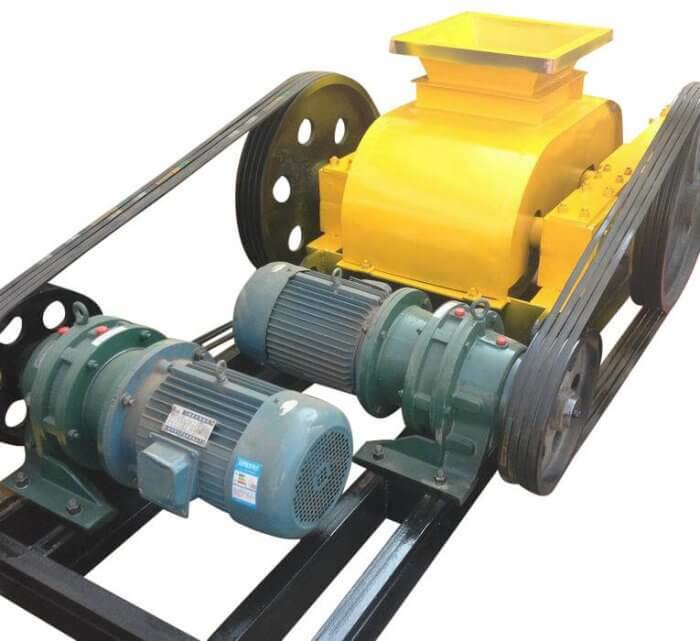 It has remained, however, for the boldness and originality of Mr. Edison to extend the field of crushing-rolls in two new directions, and to cause them to exercise new functions. In developing crushing-machinery for his Portland cement works, Mr. Edison constructed “giant” rolls, having a diameter of 6 ft. and a length of face of 7 ft. With these he was not only able to challenge the long-established position of the jaw and the gyratory crushers as primary crushers, but even to leave them well in the rear. 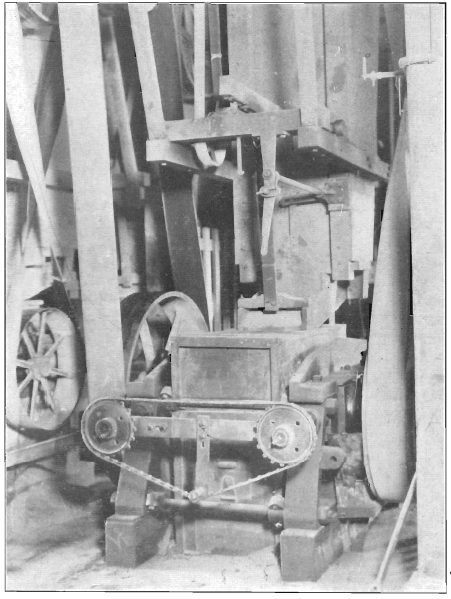 By means of projecting knobs on the roll-surfaces he utilized the stored energy of the revolving rolls, and was able to shatter masses of rock of so huge a size that they could not otherwise be made to enter the rolls, thus saving the expense of block-holing and sledging, which is usually charged to quarrying. This work has had successful applications in crushing limestone rock, and there remain also possibilities of the extension of this new use of rolls to rocks of a still harder nature. In going to the other extreme of size-reduction, Mr. Edison has also utilized rolls in pulverizing cement-rock in his work. For this purpose, rolls with sectional, corrugated, chilled-iron shells 30 in. in diameter and 8-in. face, are provided with shafts 18 in. in diameter, and are forced together with a spring pressure of 100 tons. The feed-material, which has passed a 0.75″ screen-opening, is thus reduced in a single operation to a size at which 94 per cent, passes 100-mesh screen, at the rate of 60 tons per hour. This use of rolls carries the principle of choke-crushing to so extreme a limit as to involve practically a new function. 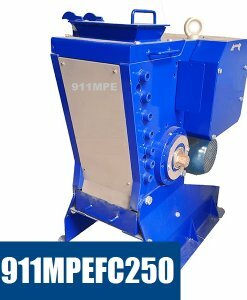 It would appear at first sight, however, that there is less profit-margin for rolls in pulverizing than in mass- reduction, and only a close comparison of the final products obtained and the respective costs per ton can determine the relative economy of rolls for pulverizing when compared with the tube-mill and other types of grinding-apparatus. 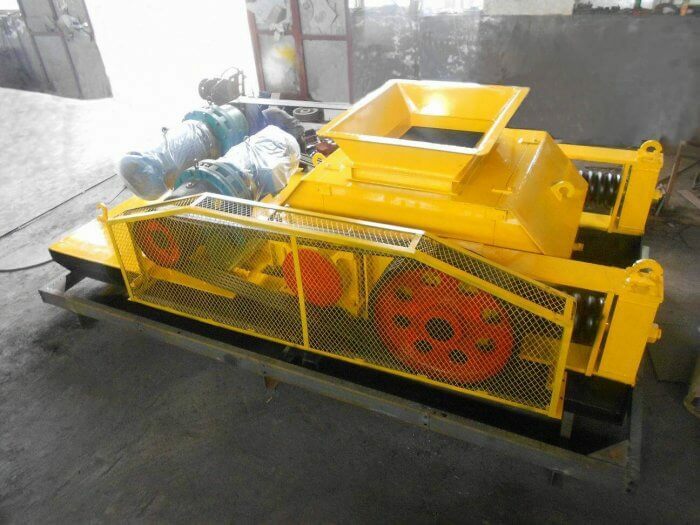 Perhaps the most distinctive advantage of rolls is that their construction permits them to apply the principle of “arrested crushing” to a greater range of sizes than is possible with any other type of crushing-apparatus. 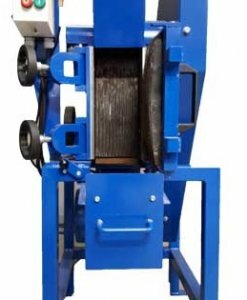 The crushing-pressure exerted by the opposing roll-surfaces during the angle of nip is instantly released and ceases when the rock-fragments reach the horizontal diameter of the rolls, where the open space between them permits the material to be discharged. 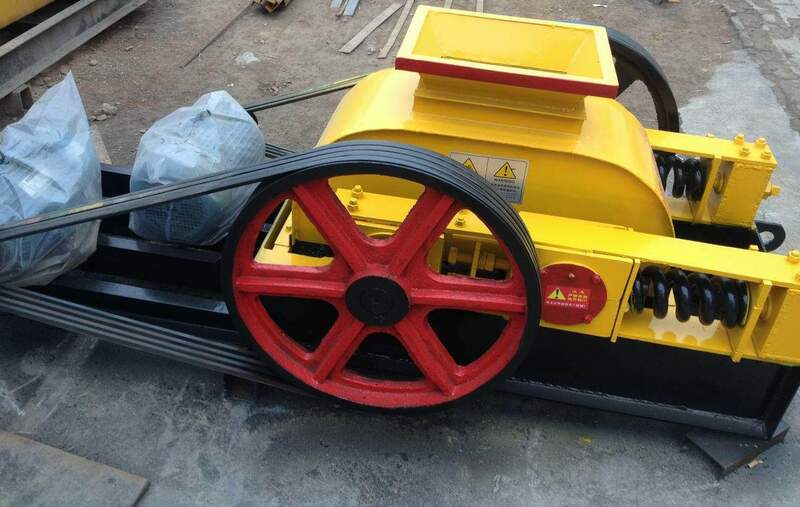 Roll- crushing thus permits most careful and accurate stage-reduction within a wide range of sizes, and avoids pulverizing and sliming an undue amount of the softer minerals of an ore, in crushing it to the size at which they will unlock sufficiently from the surrounding gangue to permit their concentration to take place. 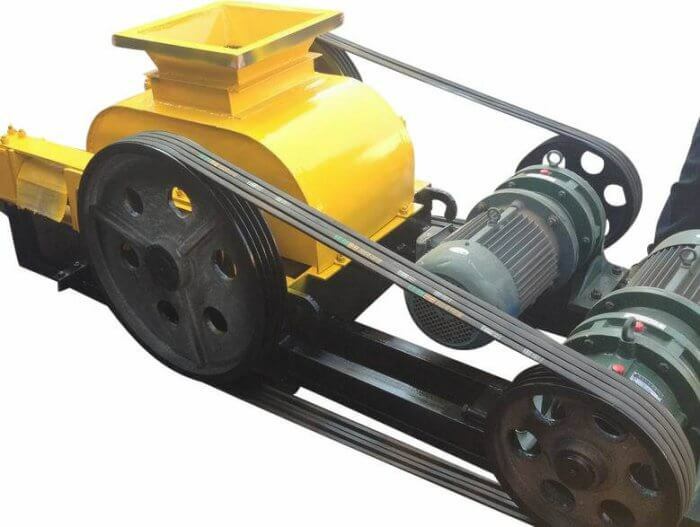 For those ores, therefore, which require concentration, the use of rolls in preparing them for jigs, shaking-tables, or magnetic separators has become almost the universal practice. This applies to many iron-, copper-, lead-, and zinc-ores. Gold- and certain silver-ores, both those which require concentration and those which do not, are in a class by themselves, since usually their values can be extracted without essential relation to the granular condition of the crushed product. The modern tendency to reduce milling-costs by increasing the mill-capacity has demanded a greater duty from rolls than ever before, and in the larger mills rolls are now employed from 36 up to 54 in. in diameter, and from 15 to 28 in. width of face. 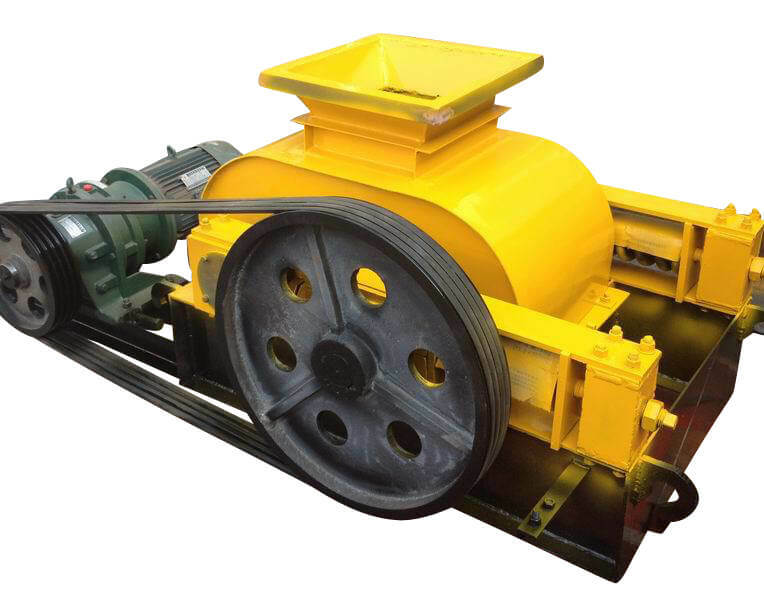 Such rolls are used mainly for coarse crushing ; that is, they take the product from the jaw or the gyratory crusher, from 1.5 to 2.5 in. in size, and reduce it to about 0.5 in. These coarse or No. 1 rolls are then followed by other rolls set closer together for finer crushing, and possibly by others which re-crush certain middlings products obtained in the process of ore-treatment, or even tailings, dependent upon the nature of the ore and its association. Rolls of this general character require massive construction and excellent workmanship. Rolled-steel tires can now be obtained up to 54 in. in diameter. Special hard steels, such as chrome- and manganese-steels, are also used for certain ores, either in the form of tires or of plates bolted to a central mandrel. In this way the life of the crushing-surfaces has been much prolonged. Marked progress has thus been made within recent years in the field of coarse crushing by means of rolls, in response to the greater demands of modern mill-practice, and this progress has been largely brought about by increasing the dimensions of the rolls and adopting a more massive construction, as well as a better design, combined with a wider choice of steel adapted to different ore-requirements than has heretofore been available. On the other hand, it must be admitted that up to the present time rolls designed for fine crushing, where the ore- requirements demand a maximum granulating effect and a minimum pulverizing or sliming effect upon the crushed product, have made little progress compared with rolls designed for coarse crushing. In fact, rolls, as heretofore designed, can hardly be said to have held their own; and since little assurance of their satisfactory operation can be had in connection with an ore which must be reduced to pass a 20- or 30-mesh screen while retaining the crushed material in a granular condition, rolls have been assailed on all sides by various types of ball-mills and other pulverizing-apparatus which claim to accomplish the function of granulating an ore successfully, but usually by means of some reduction in the time during which the pulverizing effect takes place. While there may be an overlapping territory at the limit of fine granulation where pulverizing-apparatus may be so adjusted as to perform the function of approximate granulation with sufficient success to make their use advisable, yet it is clear that a crushing-force exerted upon material placed between walls which do not touch when at their minimum distance apart, must produce a distinctly better granulated product than when it is crushed between walls which are brought into physical contact with a grinding-pressure. With the presumption of advantage thus on the side of rolls, even down to the finest sizes, the fact remains that heretofore rolls have proved unsatisfactory and inefficient, from lack of control over the granulating action as the roll-faces wear, and also from their small capacity. In looking more closely into the cause of this inefficiency, it is evident that the effect of the irregular wear of the roll-faces becomes a more serious matter in fine crushing than in coarse crushing, for the reason that in the former, since the faces must be brought quite close together, the ratio of the sectional area due to irregular wear to the total areal opening between the rolls is greater than in the latter case. 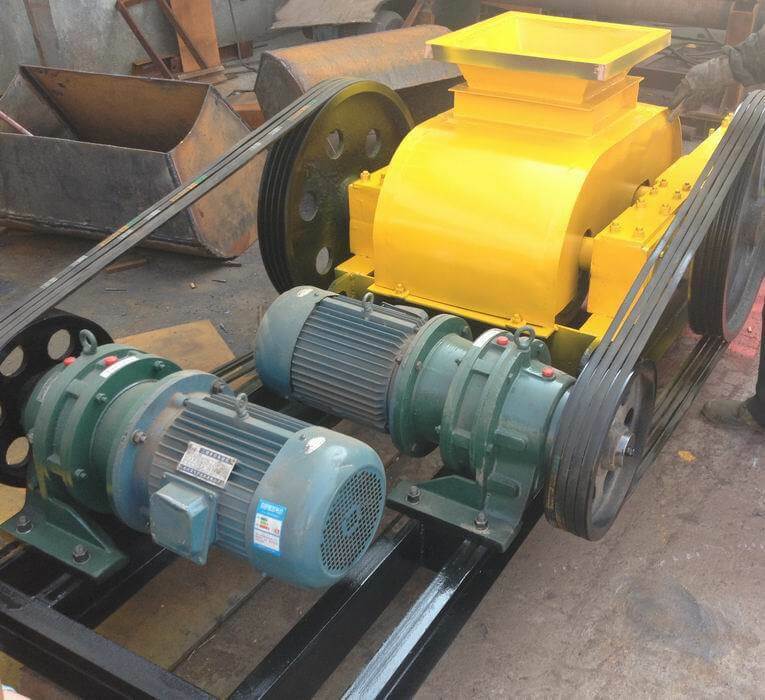 Hence any ridging, grooving, or corrugating of the roll-faces permits a considerable proportion of the particles in the feed-stream which enter the depressions to pass between the rolls without being crushed. This reduces the capacity of the rolls, measured by the amount of “ under-size ” or finished product obtained. Another difficulty arising from irregular wear of the roll-faces is due to the fact that when out of parallelism rolls tend to exert a certain component of the crushing-pressure at right angles to the diameter of the rolls, or in the direction of the axes of their shafts. This produces an end-thrust upon the roll-shafts, which, transmitted by means of collars to their bearings, causes them to heat and the shafts to cut, thus absorbing power wastefully, and still further reducing the crushing-efficiency as measured by the power consumed to operate the rolls in relation to the amount of finished product obtained. Rolls used for fine crushing thus show a decreasing efficiency in proportion to the wear of their roll-faces until a point is reached where it becomes necessary to stop the crushing- operation, and to restore the faces by chipping, grinding, or machining them until their surfaces are parallel. This involves loss of time and of mill-capacity, besides expense and a wasteful use of the roll-shells. While a certain amount of choke-crushing is usually advisable in fine crushing, in order to offset some loss of capacity, the best results can only be obtained, where the prime object is to granulate an ore, when the roll-faces are maintained parallel, and when the feed consists of sized material in order to avoid packing and pulverizing it in passing it between the rolls. It seems clear from the above considerations that further advance in the art of fine granulation by means of rolls can only be expected by means of certain refinements of function whereby the roll-faces can be maintained parallel while they undergo wear. Having had the problem of fine granulation in mind for some time past in its relation to the treatment of certain classes of ores, I have been gratified to find in a recent design of rolls by J. S. Frazee, of Brooklyn, N.Y., that he has completely overcome the obstacles which have heretofore prevented the satisfactory operation of rolls when used for fine crushing, and when a granulated product is required. Mr. Frazee has given me the privilege of presenting a brief account of his rolls to the Institute; and as I believe they are not generally known, I take pleasure in doing this, in the confident belief that they mark an important step in the advance of the art of roll-crushing. Figs. 1 and 2 show a side and an end view of a pair of 18- by 12-in. rolls. It will be seen from Figs. 3 and 4, which show the same rolls in part sectional elevation and plan, that the bearings of the roll shafts are supported in side-frames. These are of castiron, without tension-rods, and are held together by stay-bolts and lock-nuts to permit the width between the frames to be slightly adjusted, if necessary, when the rolls are in place. 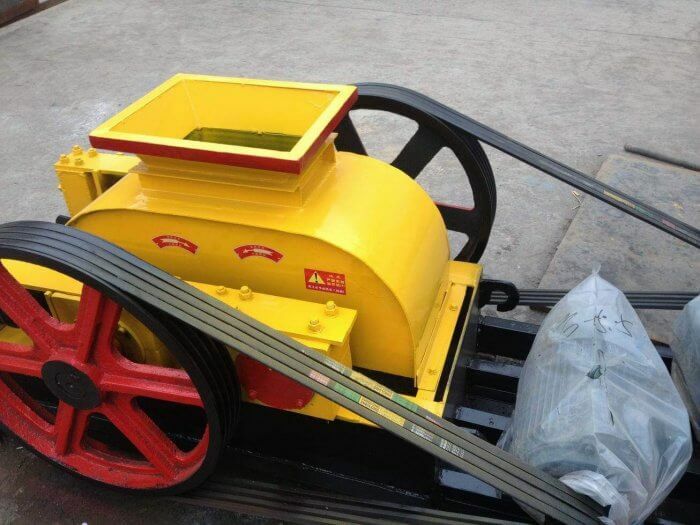 This construction has certain advantages for fine crushing over the single bed-plate or frame. It is lighter, less expensive, and permits the rolls to be completely boxed in by means of a wooden housing. This is hoppered at the bottom, and is connected with an exhaust air-pipe, through which the fine dust is drawn by means of a fan, thus keeping the mill-space free from dust. The bearings are of the solid type, lined with babbitt, and each provided with dust-caps at each end. All four are movable in the guides provided for them in the frames. Two of the bearings are held against a spring pressure, and the other two against screw adjusting-bolts, for the purpose of regulating and controlling the space between the roll-faces. These adjusting-bolts are provided with sprocket-wheels and an endless link chain, which is kept taut by means of-a small idler between them. By inserting a long-handled spanner in openings in either of the sprocket-wheels, the adjusting-screws can be moved in exact unison in varying the position of the roll-space. Fig. 2. —End-View of 18- by 12-IN. Frazee Rolls. This feature has been found a very convenient one, as it permits close and accurate adjustments of the gap between the roll-faces to be made while the rolls are running. than the other, so as to permit flanges to form on it, between which the shorter roll revolves, with a slight clearance. The rolls are fed from a hopper, which is supported independently of the roll-frame, and in such a position as not to interfere with the removal of the rolls. The lower end of the hopper is made of cast-iron, and is provided with a gate, which is operated by means of a shaft and levers, so that it can be controlled from the forward end of the roll-frame. 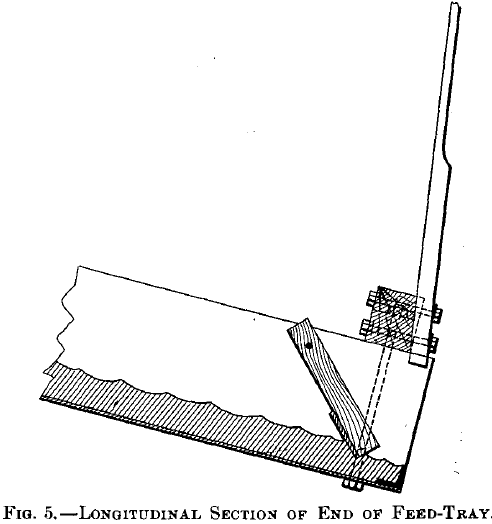 A feed-tray is placed below the hopper so as to convey the material to be crushed from the hopper-gate to the space between the rolls. 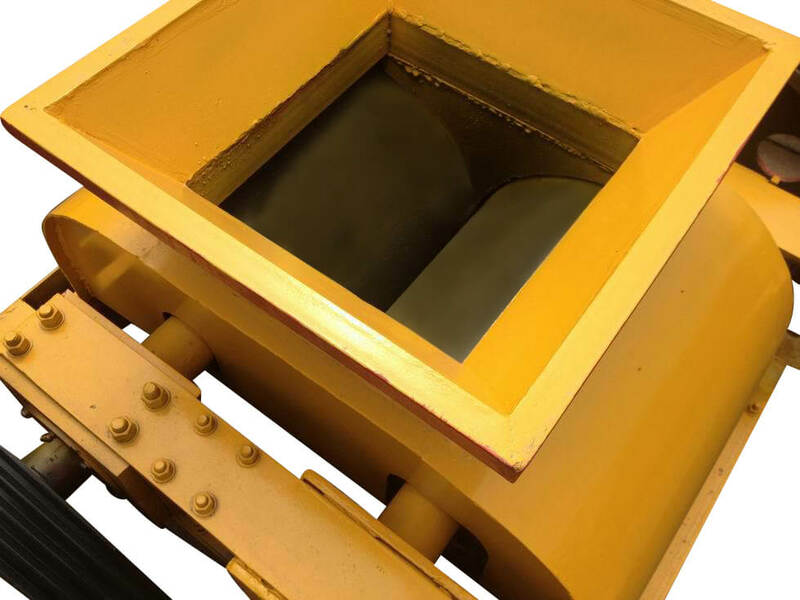 This feed-tray is supported at the back of the hopper by a pivot-bolt, which allows it to rotate slightly, and at the front end by means of a wooden connecting-rod to a horizontal arm flexibly connected to a support at the front of the hopper. When the front end of the arm is raised by the teeth of the revolving cam below it,the discharge end of the feed-tray is caused to rise and fall with a jarring or bumping motion. This causes the material in the feed-tray to be carried forward and to he discharged in a steady stream over the angle-iron which forms a lip or dam at the extreme edge of the tray. The bottom of the feed-tray is made of sheet-steel to permit the material to slide freely. The amount of motion imparted to the end of the feed-tray can he varied by means of an adjusting screw-bolt, which regulates the height of the drop of the horizontal arm, and thereby also the effect of the bumping action upon the feed. A small lever at one side of the adjusting-bolt permits the horizontal arm to be raised above the level of the cam, and in this way the feed can be instantly stopped and started. It has been a common experience that as rolls are usually fed, even when great care is taken to secure a feed-sheet of uniform thickness, the roll-shells will groove and wear more rapidly at their centers than at their ends. This is frequently caused by a difference in the rate of flow of the feed-stream, owing to friction of the sides of the chute or spout leading from the hopper to the rolls. Another cause of greater wear of the central portion of the roll-shells is the greater mobility of the feed-stream in certain directions than in others, when subjected to a crushing pressure. This difference in mobility causes a difference in the amount of abrasion, and it shows itself by the cupping, grooving, or corrugating of the roll-faces along the center, and by ridging at the edges of the roll-shell. Mr. Frazee has found that the difficulty of irregular wear of the roll-shells can be entirely overcome by a close control over the sectional shape and area of the feed-stream, and by feeding a greater amount of material along the sides of the roll-faces than at their centers. As shown more clearly on a larger scale in Figs. 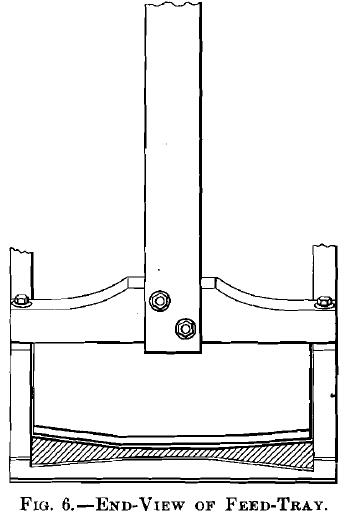 5 and 6, the projecting side of the angle-iron which forms the lip of the feed-tray is cut down at its two ends, so as to slope gradually towards the ends, leaving its full height only at the center. In this way the feed-stream passing over the lip or dam is made thicker at the ends than at its center. Furthermore, to regulate the flow and upper contour of the feed-stream, as well as the lower, a guide-plate, which is usually hinged to the sides of the feed-tray, is allowed to rest upon the surface of the feed- stream. This is provided with a wearing-plate at its lower edge, and is so beveled at its two ends as to permit a somewhat greater freedom of flow of the feed-stream at its edges than at its center. The shaded area in Fig. 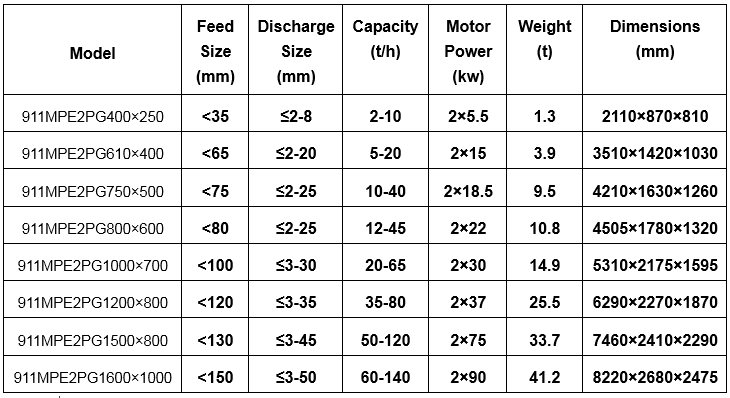 6 shows the approximate cross-section of the feed-stream, which is adjusted to secure an equal abrading effect across the entire width of the roll-faces, and thus to maintain them in perfect parallelism while they undergo wear. 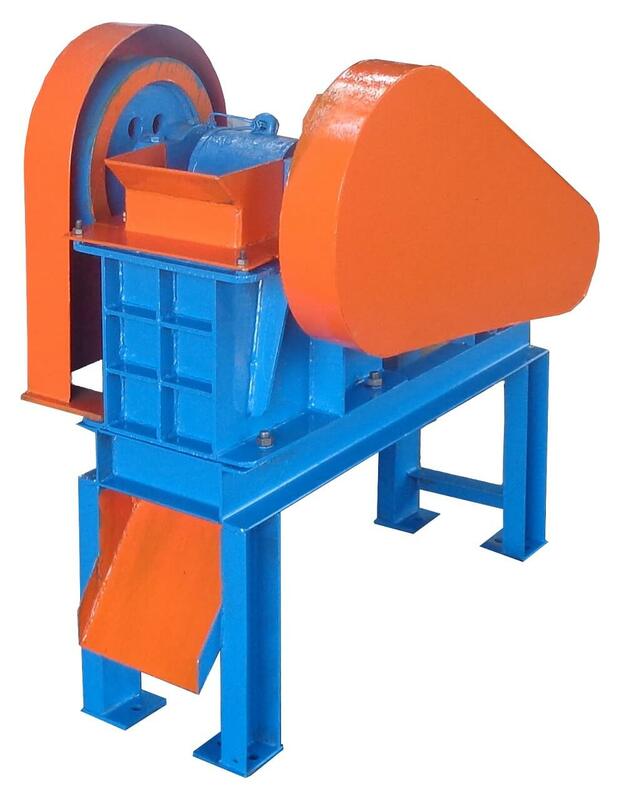 The exact cross-section of the feed- stream will vary somewhat with the hardness of the different materials to be crushed. 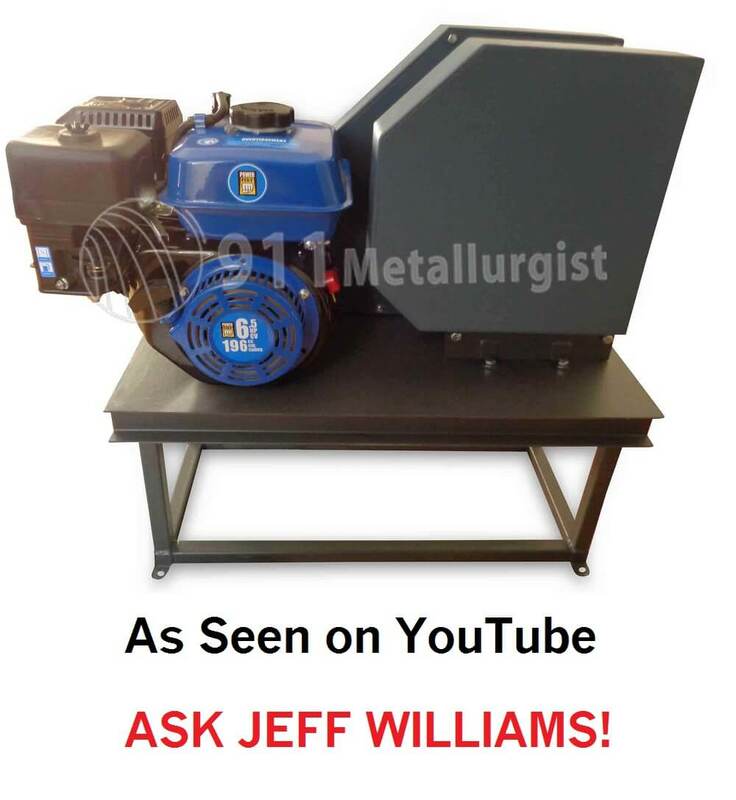 This can be easily adjusted by varying the amount of bevel given to the edges of the angle-iron and of the guide-plate in the feed-tray until the feed-stream exerts the desired uniform abrading action. 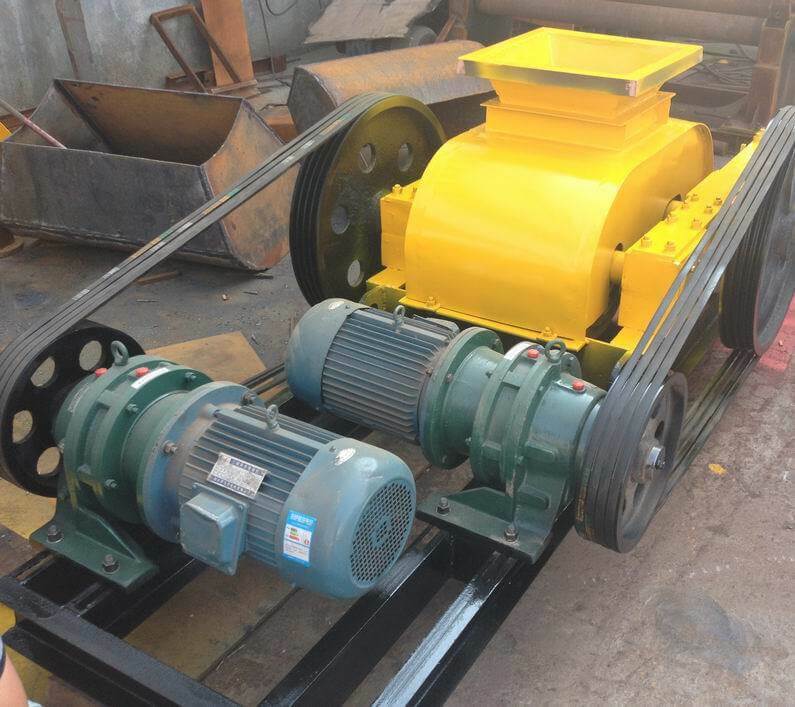 The flanges upon the longer roll-shell perform two functions. They not only confine the feed-stream at its ends, and prevent ridges from forming at the ends of the unflanged roll-shell, but by carrying the feed-stream a slight distance beyond the end of the shorter roll-shell, a small amount of crushing is performed between the sides of the flanges and the ends of the roll-shell. 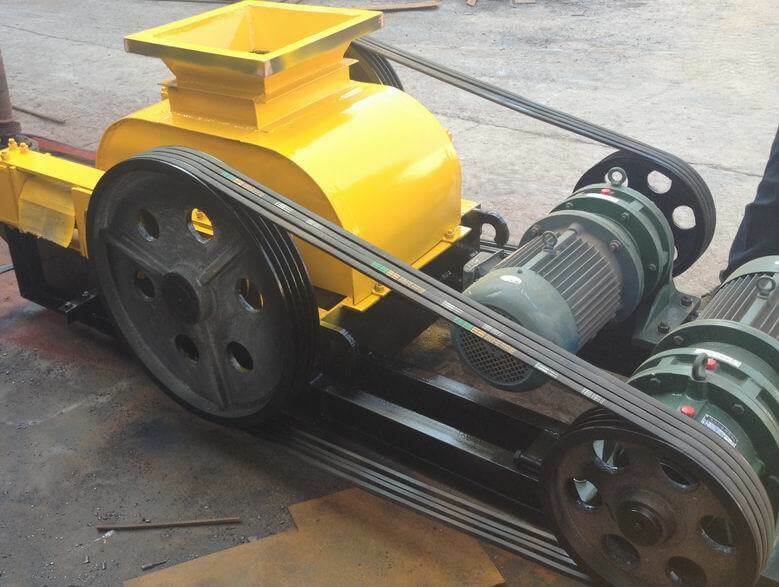 This flange-crushing, being in opposite directions, balances, and all tendency to exert end-thrust of the shafts against their bearings is thus neutralized and overcome. By the simple means thus provided it becomes possible for the roll-tender to maintain the roll-faces parallel while crushing even the hardest material, and to keep the rolls in continuous operation until the roll-shells are completely worn out. The only assistance required of a machinist is occasionally to turn off the edges of the flanges when they become so long that they strike the bolts of the opposite roll which hold its roll- core in place. Figs. 7 and 8 illustrate the effect of Mr. Frazee’s invention in connection with 12-in. and 24-in. roll-shells, in keeping their surfaces cylindrical until the shells are completely worn out. The 12-in. roll-shell shown in Fig. 7 has been reduced to 6.75 in. in diameter. Fig.7- A 12 by 14-in. Roll-Shell, Mounted Upon its Shaft, and a Flanged Roll-Shell of the Same Original Size Worn Down to 6.75 in. in Diameter, its Surface being Maintained Cylindrical without any Machine-Work having been expended upon it. 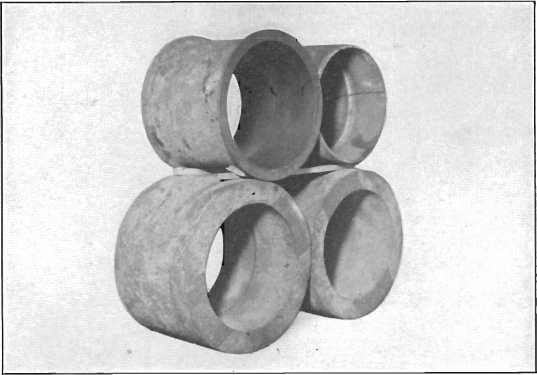 Fig.8- A pair of Worn-Out Roll-Shells Originally 24 in. in Diameter and Reduced to 19.25 in. in Diameter by Wear alone Placed above a pair of 24-in. Steel Roll-Shell Castings. 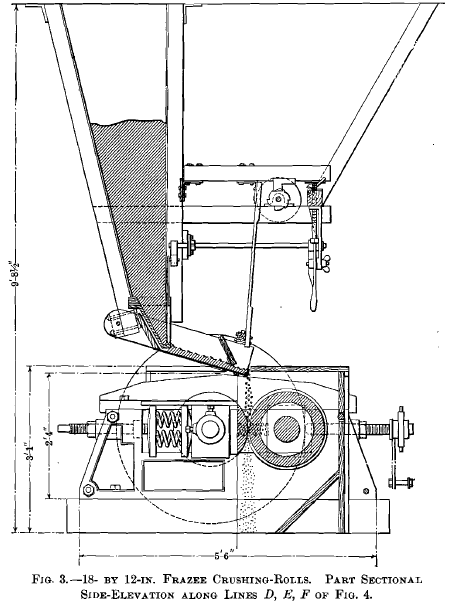 While the method of feeding the rolls which Mr. Frazee has adopted accomplishes admirably the purpose for which it was designed, and secures a close control over the feed-stream at its point of discharge, it is evident that the same principle might also be adapted to other types of feeders, such as the roller- feeder, the shaking-feeder, the plunger-feeder, the scraping- feeder, etc. 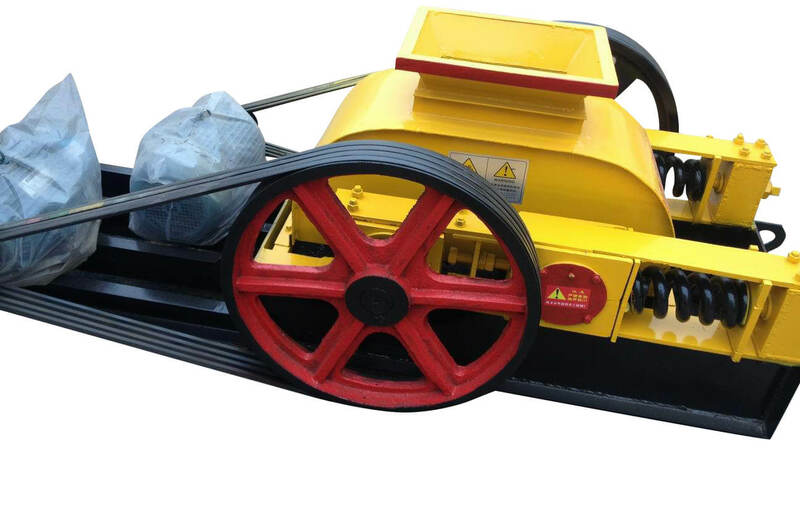 This new roll-design and manner of operating rolls has been developed by Mr. Frazee in connection with the dry crushing of very hard materials used for abrasives, such as quartz, garnet, etc. 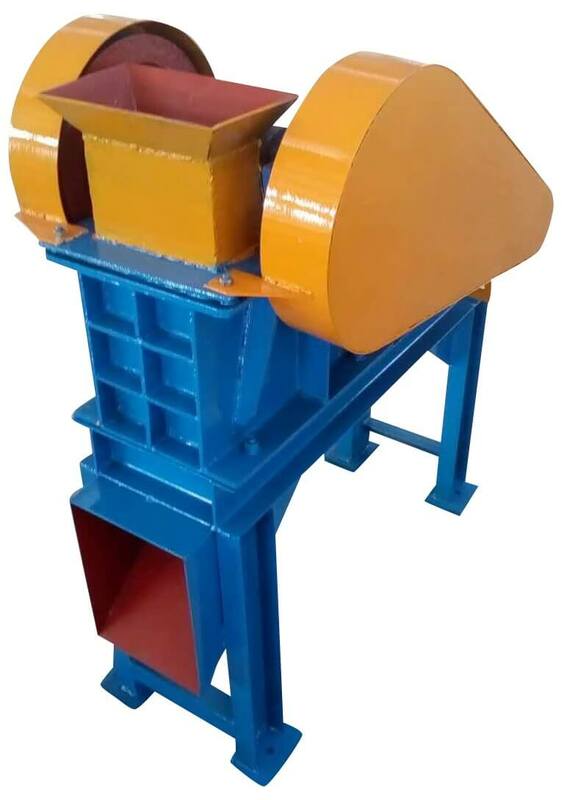 It is equally applicable to ores, and by the settling and removal of water from the mill-feed, it is possible to apply it to wet crushing as well as dry. The field which is thus opened up in connection with ores which require careful granulation, in order to prepare them for concentration, is a very large one. 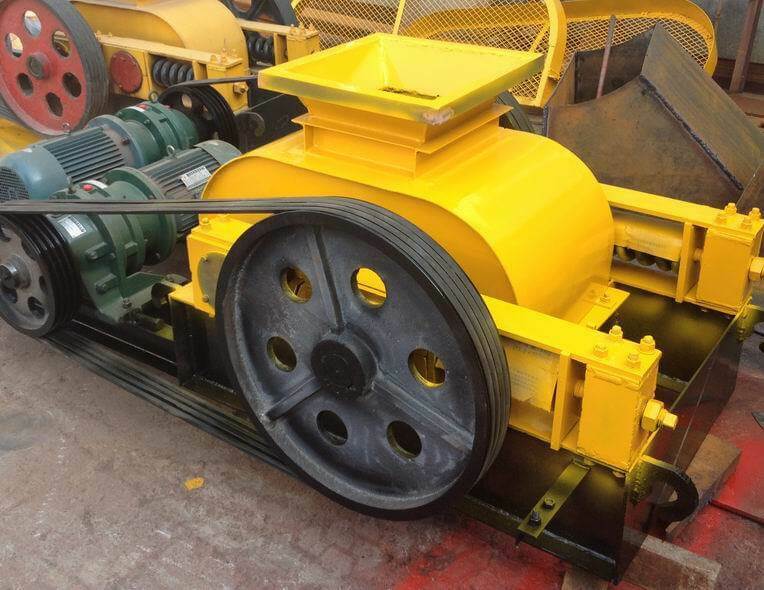 Perhaps the most interesting and obvious application of Mr. Frazee’s new roll-design is in connection with the treatment of complex ores. Innumerable processes have been proposed for the recovery of the values contained in these perplexing ore- mixtures, but they may be divided broadly into two classes, viz., that which includes mechanical methods, and that which includes all the others, such as chemical processes, leaching, smelting, etc. While the former are the least expensive, the results heretofore obtained have been proximate only, and the recoveries have shown a low efficiency. All of these mechanical processes, whether they employ gravity, magnetic, electrostatic, or flotation methods (with the single exception of the flotation process adopted by the Minerals Separation Co., Ltd.), require an ore to be crushed to a point where the separate minerals it contains are sufficiently unlocked to permit them to be mechanically separated from each other, so that they may be collected in different groups. The point does not seem to have received sufficient attention, that any one of the above mechanical processes of treating complex ores can be seriously interfered with, if not completely upset, by the means employed to crush such ores in preparing them for treatment. The mineral association of these mixed sulphide ores is usually a very intimate one, so much so that in many cases it involves crushing them to pass a 30- to 40-mesh screen, or even finer, in order to sufficiently unlock the associated minerals. By the ordinary methods of crushing there is great danger of producing a large amount of fine powder, or slime, in crushing to such sizes. Particles of a very minute size, usually placed at about 200-mesh, then become, in a measure, a law unto themselves, and the losses in treating such material are very great. 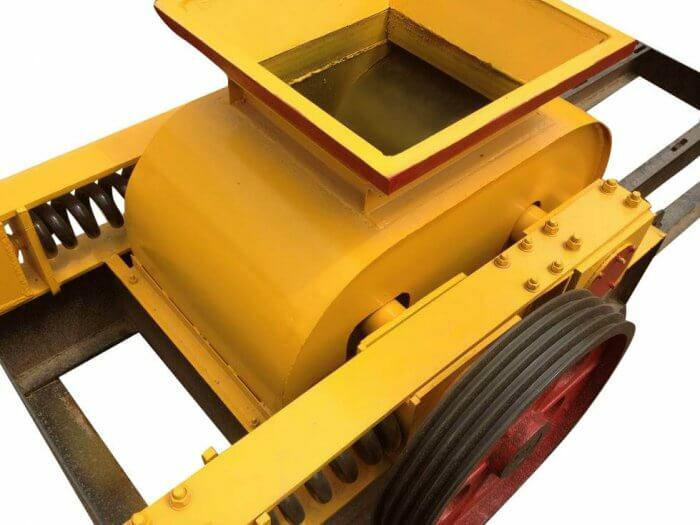 The obvious way to solve the dust, or slime, problem is not to make any dust, or slime, or as little as possible, in crushing these ores for mechanical separation. The future of the mechanical processes of ore-treatment, in competition with others which promise larger returns, will thus depend, in many cases, upon successful granulation. 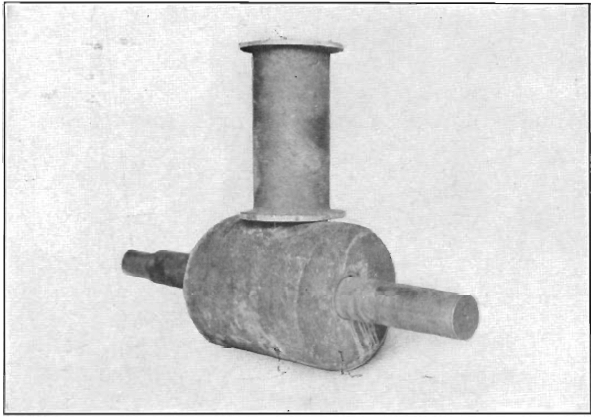 In this direction I believe that Mr. Frazee’s invention, as outlined above, has accomplished a great step in advance in the art of roll-crushing, and it holds out great hopes for the future in the more successful preparation of many ores for mechanical concentration, by reason of the control he has secured over the wear of his roll-shells, whereby a better granulating action can be obtained. Progress in Roll-Crushing. BY C. Q. Payne, New York, N. Y.